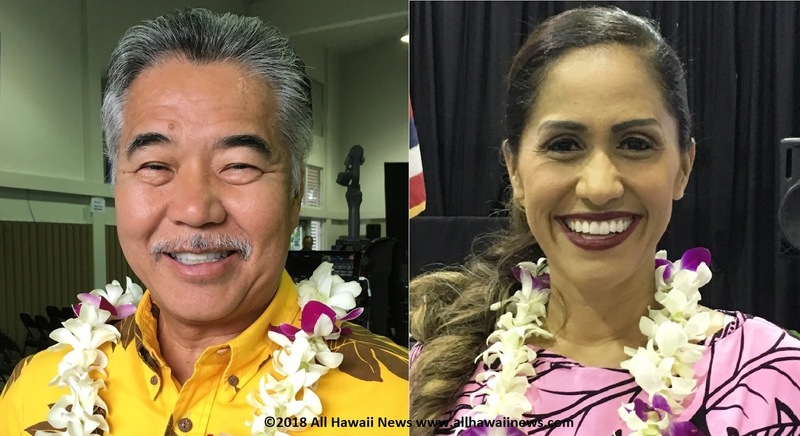 Civil Beat Poll: Voters Want Ige To Stick Around As Hawaii’s Governor. Republican state Rep. Andria Tupola trails by 21 percentage points among likely Hawaii voters in the latest survey. Civil Beat. Commission Doubles Fines For First-Time Campaign Spending Violators. New penalties were levied against 25 candidates and committees.Candidates who violate campaign finance laws will face stiffer penalties after a state commission voted to double some fines for first-time offenders Wednesday. Civil Beat. State aquaculture sales in ’17 held steady at $76.4 million. Hawaii’s aquaculture industry needed fewer workers last year but maintained sales close to a 2014 peak, according to a recent federal report. Star-Advertiser. City council takes one step closer to dipping into property taxes for rail. A proposal that allows the city to use property taxes to pay for the rail project moved forward today at city council and is one step closer to becoming reality. KHON2. Council advances bill to raise $44M for rail from city bonds. A bill allowing $44 million in city money to be used to help pay for the $8 billion-plus rail project won preliminary approval from the Honolulu City Council on Wednesday. Star-Advertiser. The Strange Intersection Of A Rail Deadline And City Council Politics. The incumbent has stalled council bills considered crucial for the project, while the challenger is a close ally of the mayor who leads the charge for rail. Civil Beat. Class-action lawsuit alleges city negligence worsened East Honolulu flooding. A group of East Honolulu residents are taking the city to court, saying its negligence contributed to historic flooding in April that did millions of dollars in damages to Oahu homes. Hawaii News Now. City of Honolulu sued over April floods. The City and County of Honolulu now faces a lawsuit stemming from April floods, that damaged hundreds of East Oahu homes. KITV. State department head sues city over flood damage. The head of the state Public Housing Authority is suing the city. KHON2. Commission gets tough on ‘monster homes’. Honolulu Planning Commission members unanimously endorsed a draft bill Wednesday that is tougher than what the city Department of Planning and Permitting proposed. Star-Advertiser. Contractors complain city’s permitting delays are forcing workforce lay-offs. Permitting department pledges to find ways to improve. Hawaii News Now. Why Are City Lawmakers Involved In This Lobbyist’s Backyard Tiff? Alicia Maluafiti’s dog kennels are upsetting her Ewa Beach neighbors. Now City Council Chair Ernie Martin has introduced a bill that would legalize them. Civil Beat. Honolulu City Council candidate Tommy Waters claims smear campaign against him and supporters. Those who support former representative Waters say they are being targeted by people who oppose their candidate. KITV. Greenpeace’s historic ship in Honolulu after studying Great Pacific Garbage Patch. Officials will also host tours to highlight the threat of plastic pollution. Hawaii News Now. Wife, daughter of HPD lieutenant perish in Kaimuki fire. Honolulu Police Lt. Nathan Wharton, the husband and father of the victims, was not home at the time of the fire. Star-Advertiser. Man challenges conviction for killing friend, claims Hawaiian sovereignty. Star-Advertiser. Council rejects tax relief for Pahoa, Volcano. Puna Councilwoman Eileen O’Hara was unable to muster support Wednesday for a resolution seeking to provide tax relief for commercial properties in Pahoa and Volcano. Tribune-Herald. DWS hopeful Honokohau deep well to return to service by end of October. North Kona has been without four of its 14 water sources for months, but the Hawaii County Department of Water Supply believes it will revise that ratio in the coming days. West Hawaii Today. A pedestrian trail that meanders from Kohala Lighthouse to recently acquired county land at Kapanaia Road now belongs to the public, with the County Council on Wednesday unanimously accepting an easement as part of a 2002 settlement agreement with a developer. West Hawaii Today. Hilo doctor, four of his employees arrested for alleged drug trafficking. Dr. Ernest Bade was apprehended at his clinic at 260 Osorio Lane in Hilo by U.S. Drug Enforcement Agency officers and Hawaii County deputies Tuesday. Tribune-Herald. The Hawaii County Council Planning Committee on Tuesday advanced a bill to regulate the Big Island’s short-term vacation rentals. Big Island Video News. Maui County officials terminated a $100,000 grant awarded to an executive assistant of Council Member Alika Atay for events celebrating Queen Kaahumanu’s 250th birthday and now will take over reviews and payments of $46,000 in outstanding receipts owed to vendors. Maui News. The Maui County Planning Department will hold two more meetings—Oct. 18 and Oct. 23, 2018—on its proposed revisions to the Maui Planning Commission’s rules on Special Management Area (SMA) permits and the shoreline area. Maui Now. The Maui County Department of Public Works will hold a community meeting Oct. 30, 2018, to discuss shoreline erosion along Lower Honoapiilani Road at Kaopala Bay in Kahana. Maui Now. The Ritz-Carlton Kapalua in Maui has sold for almost $1 million a room — one of the state’s highest hotel sales on a per-room basis ever. Star-Advertiser. Sale of Ritz-Carlton Kapalua on Maui to Blackstone closes. Pacific Business News. Rock icon Steven Tyler to perform for one night only on Maui. The lead singer of Aerosmith will play on Dec. 27. Hawaii News Now. Prominent Native Hawaiian activist Robin Danner and her son were arrested Wednesday during a confrontation with state Department of Hawaiian Home Land enforcement officers and officers of the Kauai Police Department over a disputed campsite near Anahola Beach Park. Garden Island. The state Department of Health canceled a brown water advisory Monday, the first of several that had been in effect since Aug. 31, just days after remnants of Hurricane Lane drenched the islands. Garden Island.